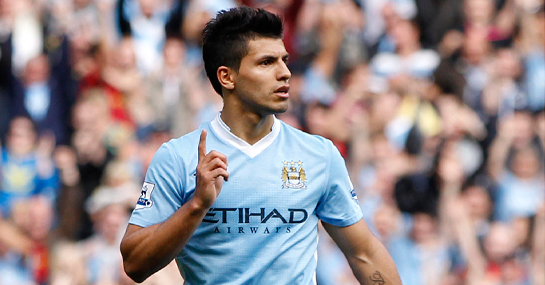 It hasn’t taken Sergio Aguero long to adapt to Premier League football. The new darling of Eastlands already had three goals to his name from his first three appearances, including a breathless double in a 30-minute cameo on debut against Swansea. But just in case there was anyone from the red half of Manchester who still dared to hope that Aguero would simply be a flash in the pan, the former Atletico Madrid striker added three more to his City tally this weekend, claiming the man-of-the-man award in another demolition display, this time featuring Wigan as helpless victims. But tellingly it was Aguero’s post-match comments that proved just how well he’s adapted to the way of the land in England’s top flight, when he played down his own personal glory by insisting that “the most important thing is that we keep winning”. It was a line straight from the footballer’s manual. But for all his modest talk, Aguero joined his teammate Edin Dzeko on six goals for the season, second only to eight-goal Wayne Rooney in the goalscoring charts. It means that his odds for the Premier League Golden Boot shortened from 6/1 to 7/2, second favourite after Rooney (5/2), a man who has had to find room in his house for two match balls already this season. But as Dzeko’s relegation to the bench despite scoring four in his last match suggested, Aguero’s assertion that the team must come first could well be the factor that prevents him from overtaking Rooney this year. For while Rooney is likely to be the surname Sir Alex Ferguson scrawls first on his teamsheet every week regardless of the competition, Mancini’s insistence on keeping his army of attacking talent happy – not to mention Champions League football requiring further tinkering – means that Aguero is not a certain starter. And with Dzeko now showing his class, Carlos Tevez returning, Mario Balotelli waiting and David Silva chipping in, free-scoring City are likely to have several names clustering the scorer’s list as they mount a title challenge. Crucially though, it’s likely to be a ruthless Rooney looking over them all come May.